¬	21 Days of Prayer – follow along with the prayer prompts listed on the card at your seat. 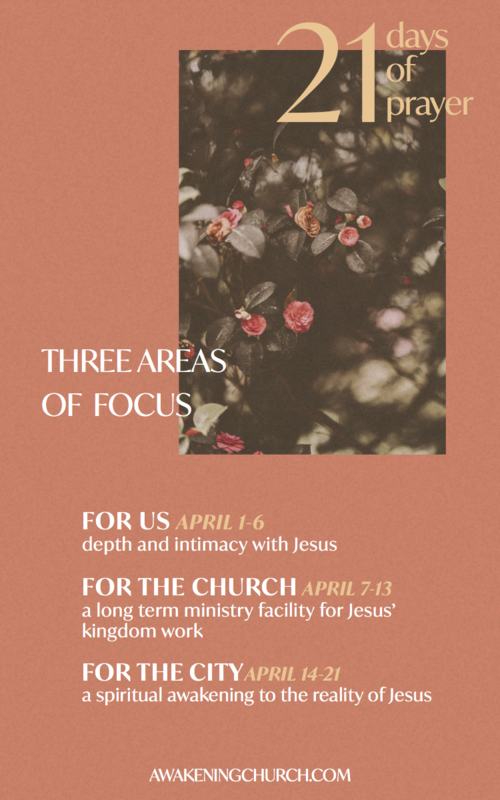 ¬	Worship + Prayer Nights – on 4/7 and 4/13 from 6-7PM, join us at the Awakening Office (1210 S. Bascom Ave, Suite 127, San Jose) for an intimate time of seeking God’s face as we worship and pray together. ¬	Prayer Room – come to the Awakening Offices Monday-Thursday between 10am-4pm to pray in our prayer room. ¬	Good Friday Experience – on 4/19 drop in anytime between 6-8:30PM at the Awakening Office for a time of contemplation & guided worship and prayer as we prepare our hearts to celebrate Jesus’ death and resurrection.